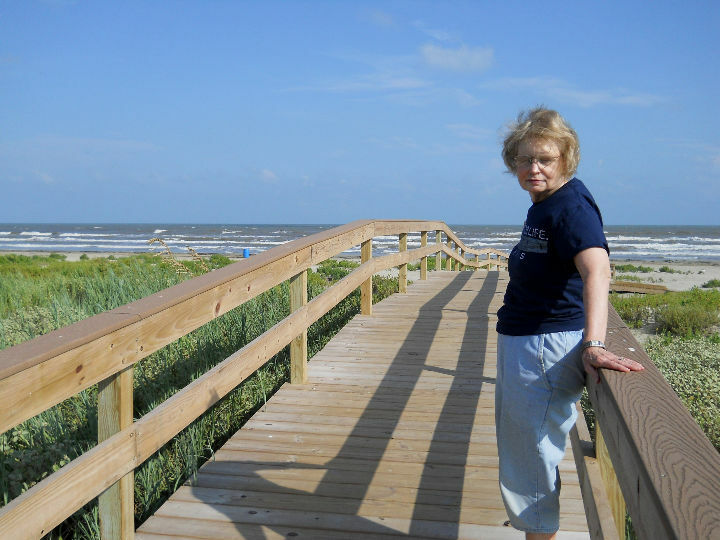 It has been two years since we last visited Galveston Island. This being the Labor Day weekend, it was not perfect timing, but Galveston is close to home and we enjoy the historic old homes and businesses, as well as the boats and birds. It is still really too hot for outdoor activities, but we plan to do things that are mostly inside, or from the truck. 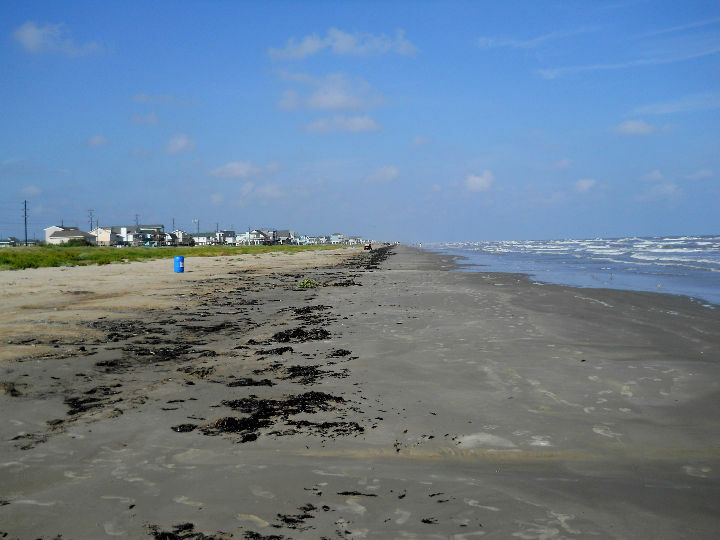 [Friday] We left home about 10:15 AM and drove south on TX-6 to Galveston Island. 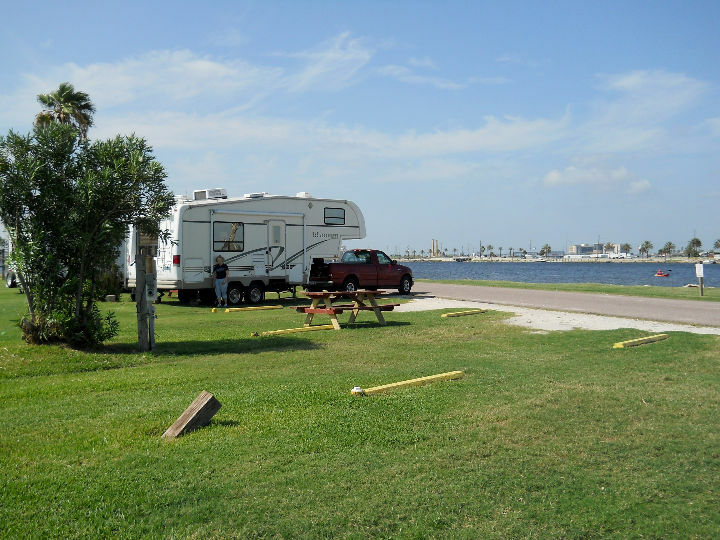 At 61st Street, we crossed Offatts Bayou and settled our 5th wheel into space C9 at Bayou Shores RV Resort. 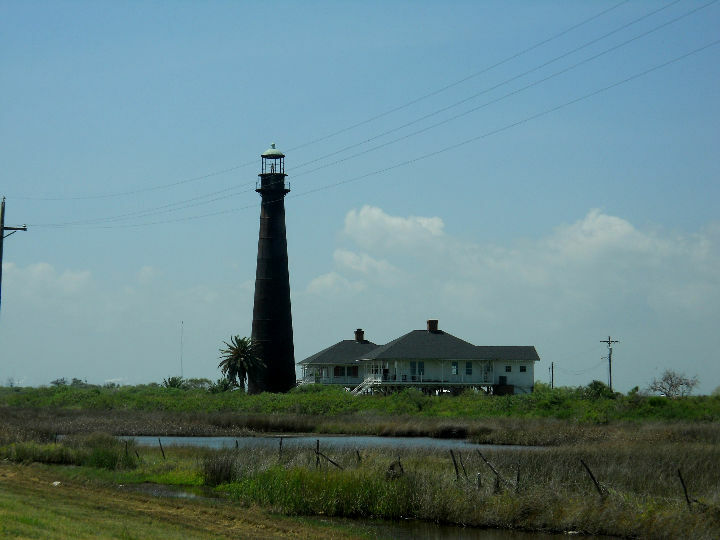 The park is located on the south shore of the bayou and is the park we have stayed in on past visits. After we set up the trailer, we ate lunch, then relaxed for a few hours. At about 4 PM, we drove down Seawall Blvd to almost the West end of the island, where the road crosses over a bridge leading to Freeport. We saw many beach homes all along the way, and stopped to inspect a new home under construction. We also stopped to go out on the beach at various points. On the way back, we drove East on Seawall Blvd to near Stewart Beach, then on Broadway back to 61st St.
< Our campsite at Bayou Shores. 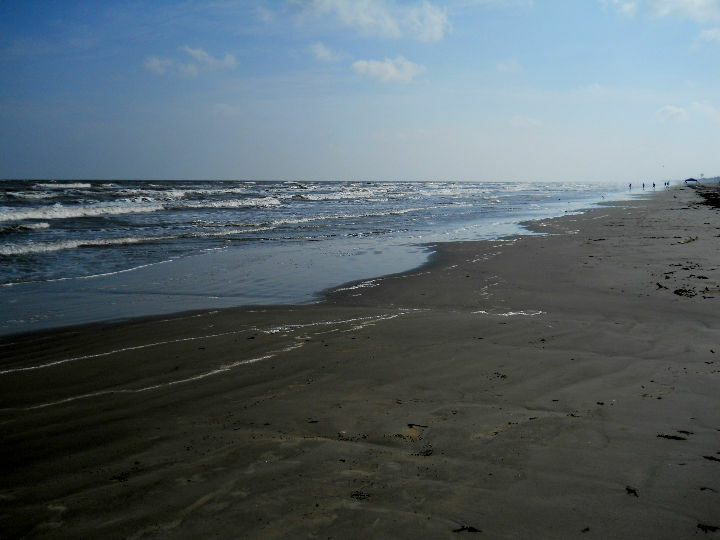 < < < < Galveston beach. 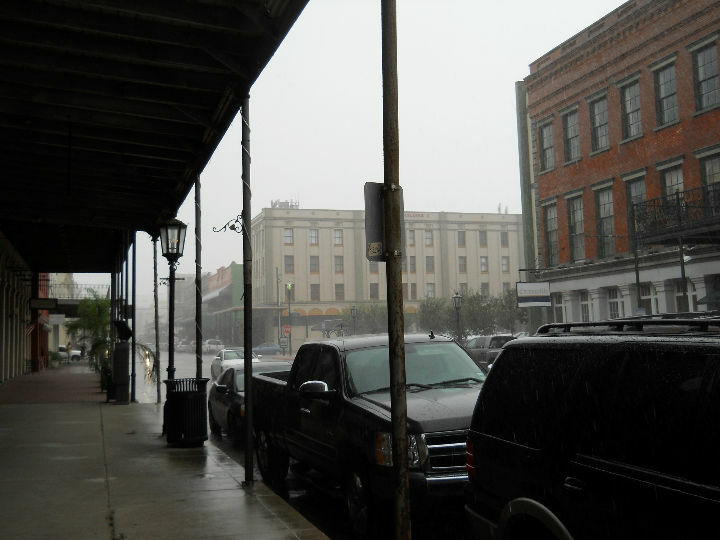 [Saturday] In the morning we were awakened about 6:30 to the sound of rain on our RV roof. We had to avoid rain showers during most of the day. First, we went to the Rosenberg Library to see the Museum located on the 3rd floor. 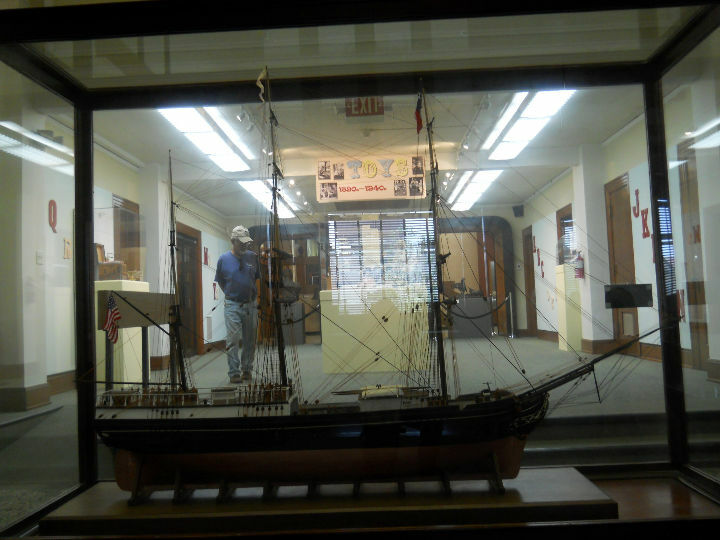 The Rosenberg Library is the oldest free public library in continuous operation in Texas. It was established and endowed by Henry Rosenberg in 1904. It is still privately owned and operated by his foundation. The library's 1st floor was flooded in 2008 by Hurricane Ike. They still haven't opened that floor, but the 2nd and 3rd floors are in operation. They still exhibit the beautiful old furnishings, as well as serve their purpose as a public library on the 2nd floor and a free museum of Galveston & Texas history on the 3rd floor. We spent the morning exploring the various museum galleries. 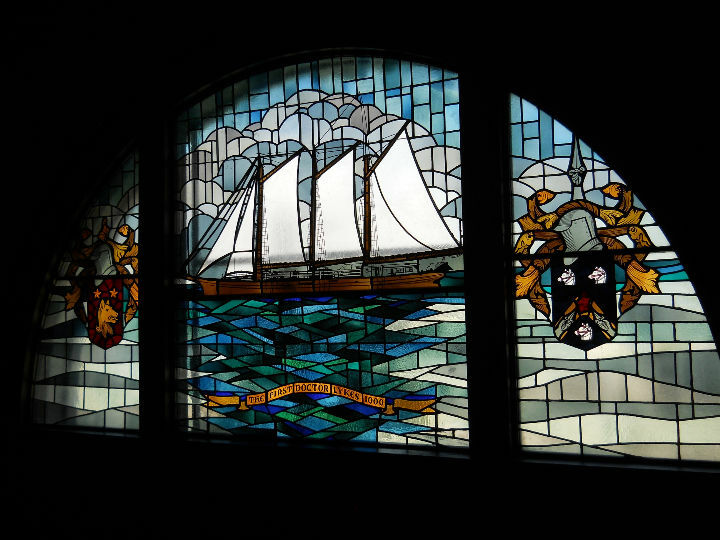 < < < Rosenberg Library & Museum. In the afternoon we drove to The Strand area. 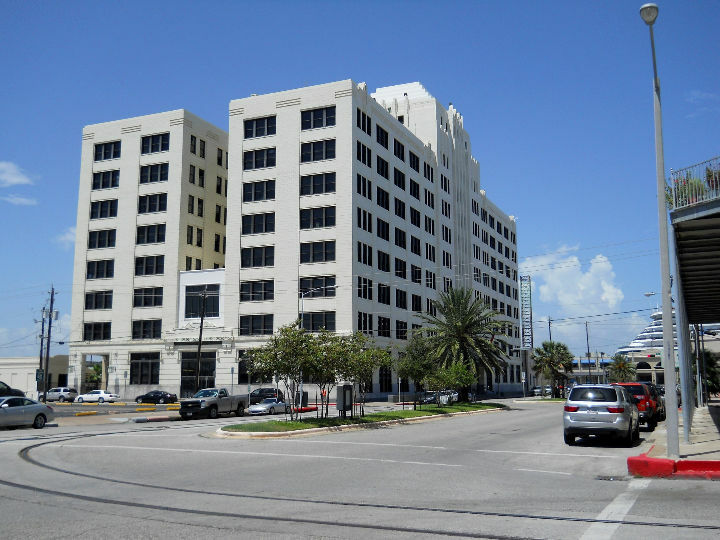 This is the historic business center of Galveston when it was the largest city in Texas and the 2nd largest seaport in the U.S. behind New York City. For a time it was known as "The Wall Street of the Southwest." 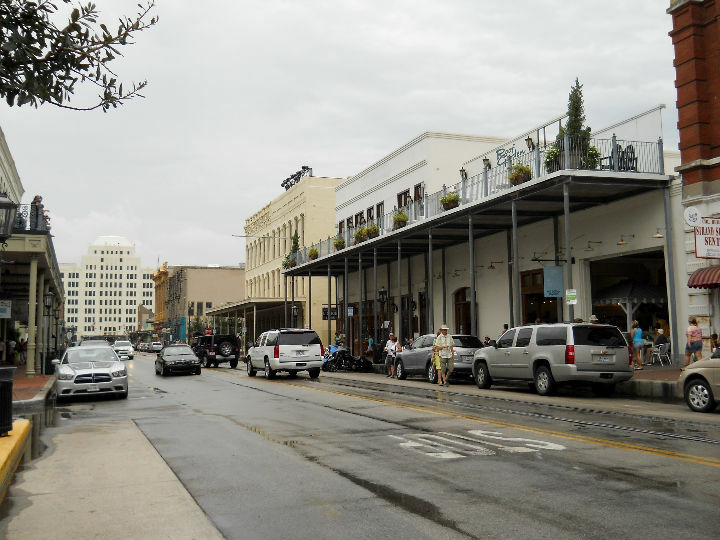 Buildings in the area date from the 1850's to the 1880's and have survived the hurricanes over the years, including the 1900 Galveston hurricane that killed as many as 10,000 people and destroyed the island. We spent the afternoon browsing antique stores and indulging in ice cream at the Candy Factory and Starbucks while dodging rain storms that passed through during the afternoon. < And the rains came. < A view of The Strand. [Sunday] In the morning we watched the live streaming of the 9:30 AM Second Baptist Church worship service on the internet from our campground. We normally visit a local church when out like this, but this time we wanted to experience the new streaming service for the first time. 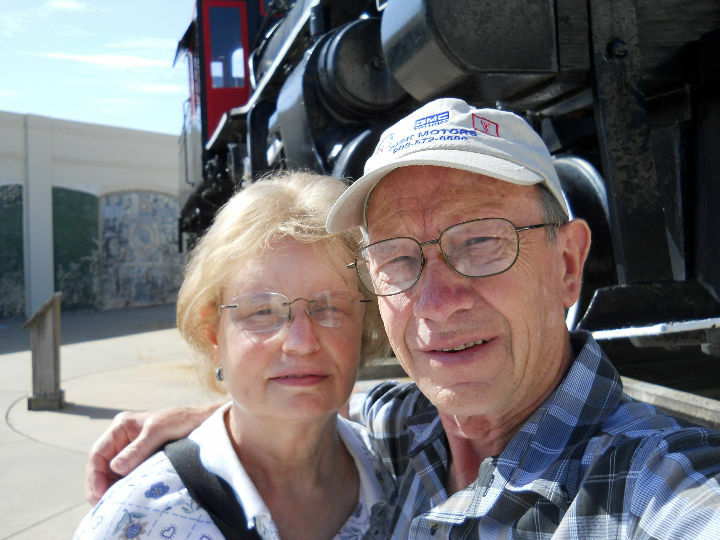 In the afternoon, we drove back to The Strand and visited the Galveston Railroad Museum. 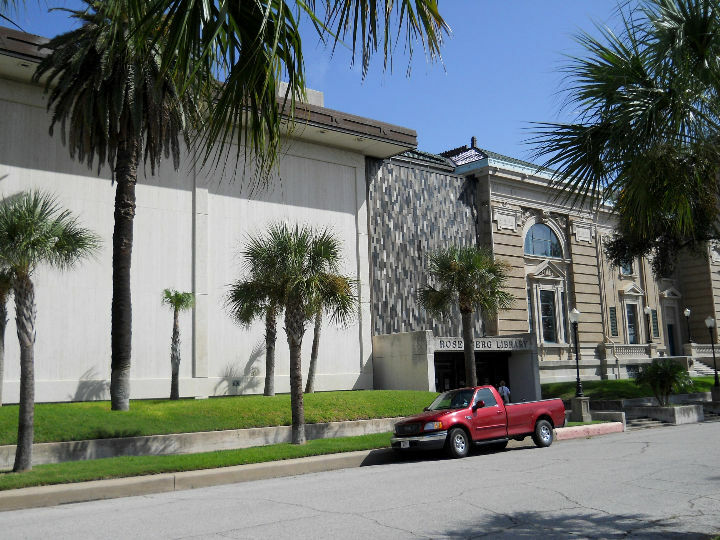 The museum has made a remarkable recovery from the devastating effects of Hurricane Ike, which flooded everything with about 6 feet of saltwater. The effects of the corrosive saltwater on the rail equipment is evident throughout. 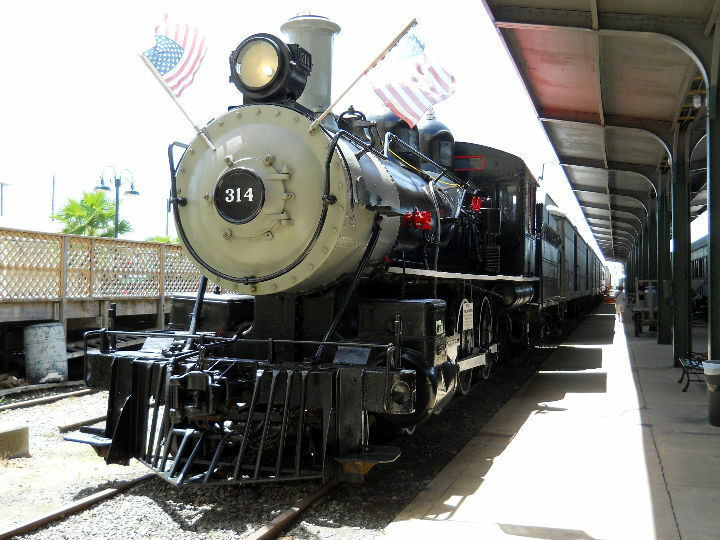 A few of the train engines have been restored to good condition, but a large number of the rail cars may never see full restoration due to the damage. Much of the museum's archives, which contained priceless original documentation, were destroyed. It was interesting seeing what they have done to bring the museum back, and also seeing photos and video of the damage. We found that September was not a good time to visit outdoor museums. It was HOT. 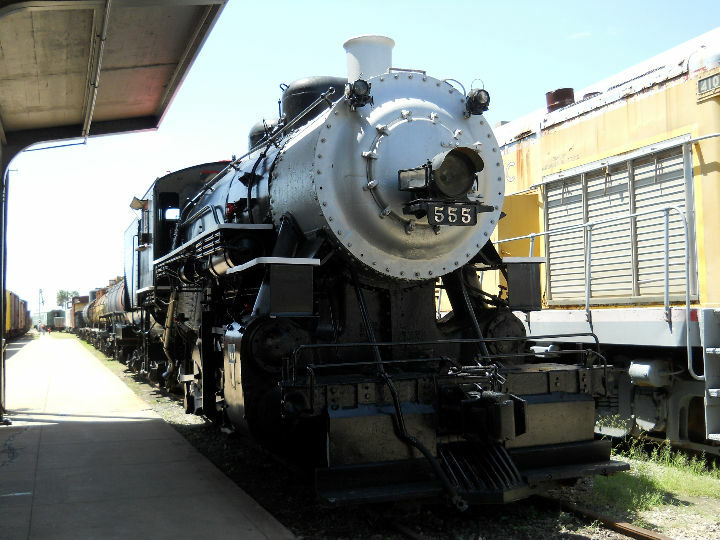 < < < < Galveston Railroad Museum. 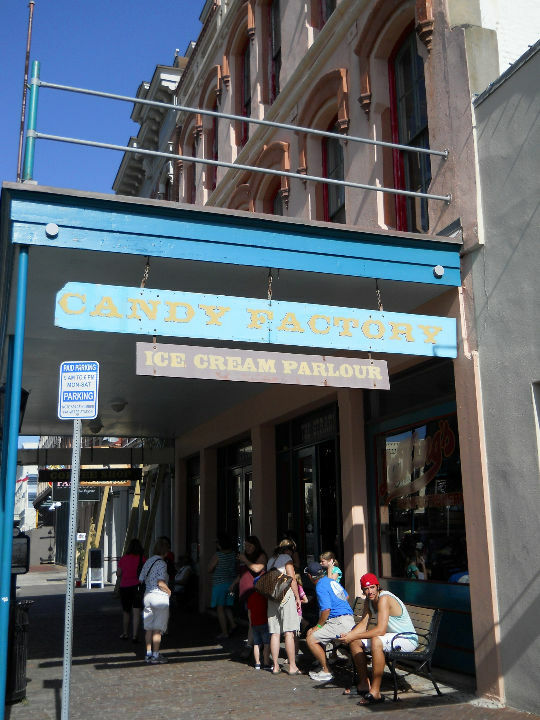 After the museum, we walked down The Strand and what do you know, we came upon The Candy Factory again. 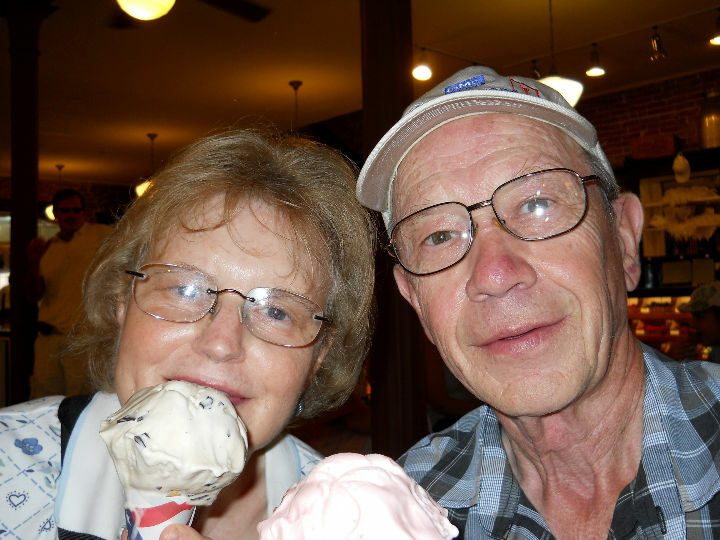 Well, the only thing to do was to have another ice cream cone. 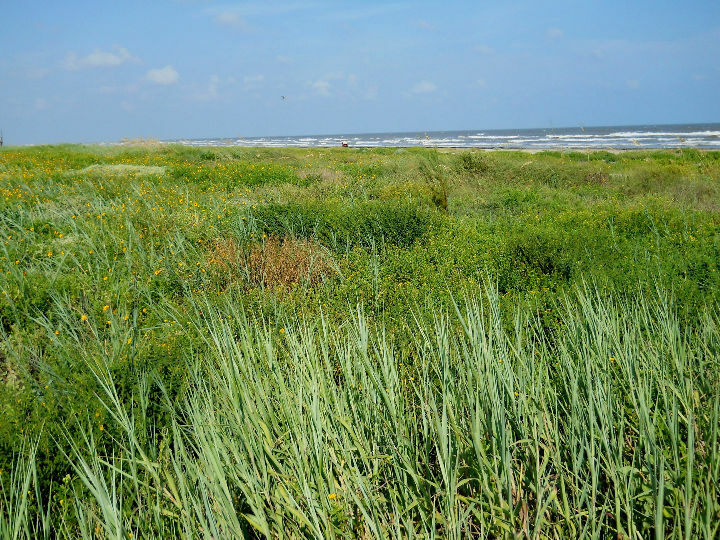 That place must do more business on hot summer days than any other business in Galveston. < < The Candy Factory. [Monday] Today is Labor Day. 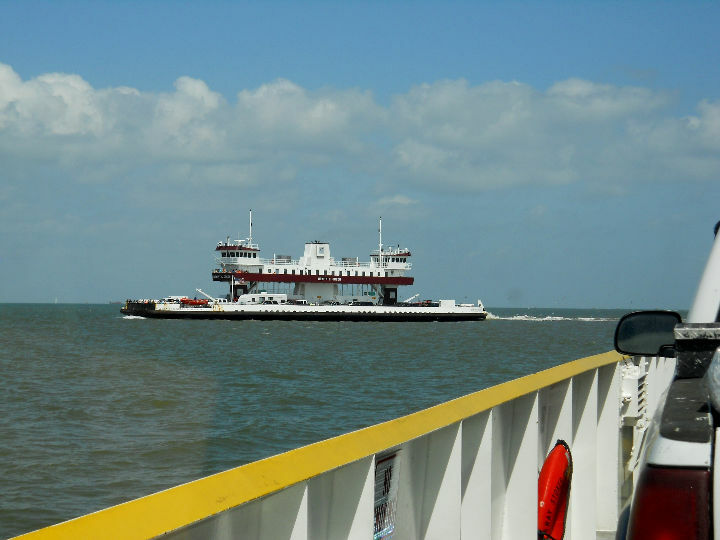 We decided to take a picnic lunch and ride the Bolivar Ferry from Galveston to Bolivar Peninsular to see how things are recovering over there since Hurricane Ike. After being completely wiped clean in 2008, it is making great progress recovering in 4 short years. 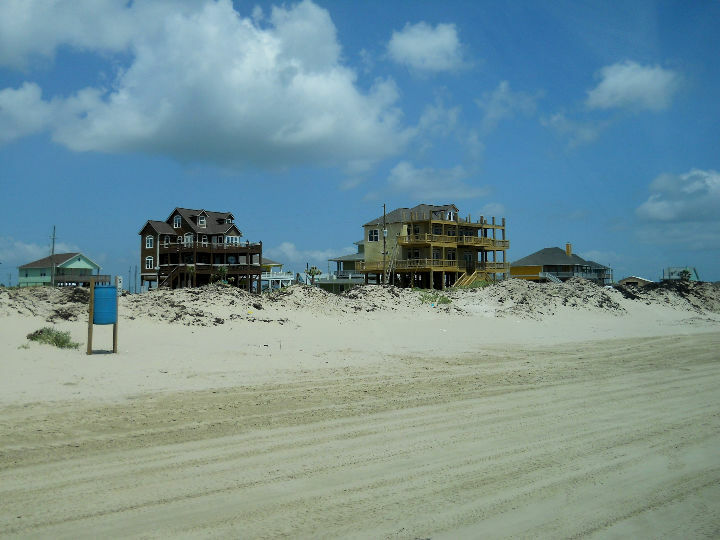 There are thousands of new houses all along TX-87 that runs up the beach. Everything is being built on massive wooden or concrete piers that raise the main living spaces of the house up to about the 20-foot level - some main living spaces begin on the 3rd level. The beach was loaded with people for mile after mile. We stopped and ate our lunch on the beach. 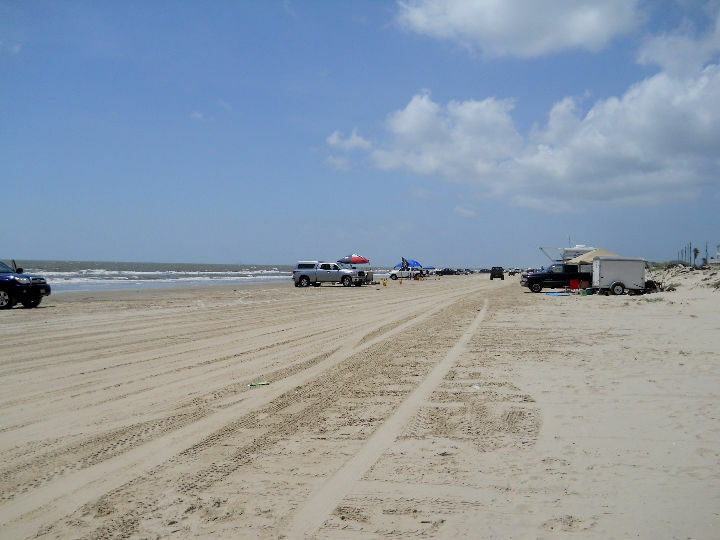 We went as far East as Rollover Pass, then returned to Galveston. It took 1 1/4 hours of waiting at the ferry landing for us to get on the ferry. < One of the ferry boats. < Boliver beach. < Large new houses on the beach. < Boliver Lighthouse. That night we decided to eat out and we found a place a little off the beaten track that had good reviews, The Black Pearl Bar & Grill in The Strand area. They had good seafood. [Tuesday] There are two historic homes that we want to see this morning. We have not seen them in previous visits to Galveston. 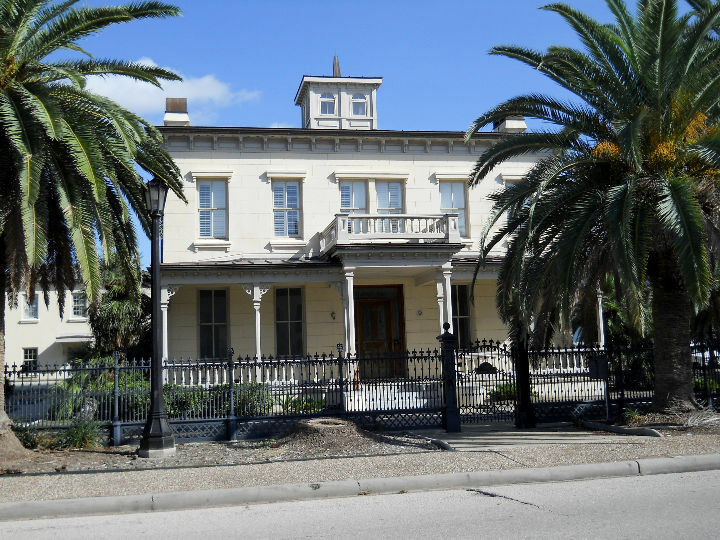 The first is the Rosenberg home, that was built in 1859 for Henry Rosenberg, one of the founding fathers of Galveston. Much of the materials were imported form Switzerland. It has 8 marble fireplaces. The outside structure is plaster over brick. It has a carved rosewood interior, high ceilings, and tall wall mirrors. Styled more after the manner of the times of the South, when wealth and elegance showed in the homes. We were not able to go inside. It probably is a private residence now. The other home is the Michel B. Menard House. Menard arrived in Texas in 1829. 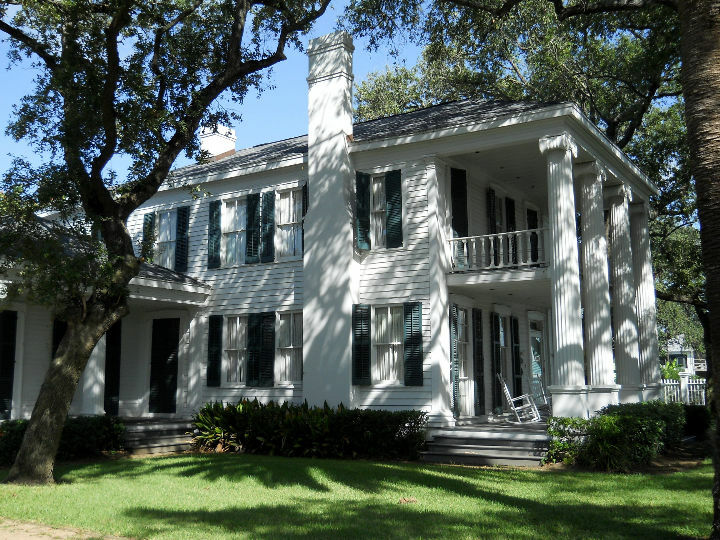 The house, built in 1838 and the oldest on the island, is in the Greek revival style. The furniture and furnishings, with few exceptions, all date from the first half of the 19th century (1800-1850s). Through a partnership with Galveston Historical Foundation, the house is operated as a museum and is available for private events. Unfortunately was not open. < The Rosenberg Home. < The Menard Home. After lunch back at the RV park, we left Galveston and made our way back up TX-06 to Richmond. This draws to a close our visit to Galveston Island. We hope you enjoyed the photos and brief descriptions of our activities. God willing, join us again soon for another RV adventure.